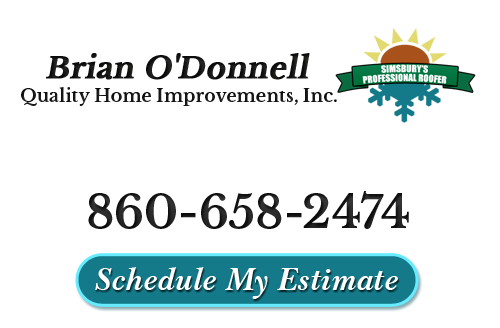 Brian O'Donnell Quality Home Improvements is the number one name to trust in for storm damage repair work for your roof in the Farmington Valley area. Having resided in Connecticut his entire life, founder and expert Simsbury roofing contractor, Brian O'Donnell, is no stranger to New England weather or the dire damage that storms can cause. This also means that he understands the frustrations of working with insurance providers and can help make sense of it all. 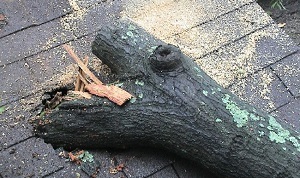 We will help you work with your insurance company to provide solutions to shingles slides, blow offs and penetrations by falling tree branches as well as anything else that New England weather can dish out. Getting through a storm of any kind can be trying enough. Having to deal with the aftermath can be like adding salt to a wound. All you want to do is get your life, and your home, back in order but it seems impossible to do. We pride ourselves on being the company that cares. The one that can help you make sense of it all and finally see the calm after the storm. It is important to act quickly when it comes to storm damage repairs; there is a small window of time that you can file a claim resulting from a storm. Too many homeowners put off getting a post-storm assessment and find out down the road that they do have damage. Once your insurance provider stops accepting claims for this event, you will be stuck paying for those roof repairs on your own. There are things that you need to know about potential storm damage to your roof. These tidbits of information will help you know a few things before the storm even happens. Many people assume that only hail can really cause storm damage to roofing systems. This misconception causes many homeowners to bypass an inspection only to find out later that they do have damage. Wind, lighting, snow and ice are all other culprits known for causing roof repair needs. The age of the roof is something else that should be taken into consideration. While a new roof may withstand high winds, your older roof may not be up or the challenge. It is better to be safe than sorry so have it checked out. Make sure to only work with a reliable, honest roofing services provider, though, or you could find yourself being talked into a roof replacement you don't need. While you should always let a professional take a look for potential roof damages, there are some obvious signs of damage that you can spot on your own. Leaks, water stains, missing shingles and displaced flashing are all things that you can see for yourself. When conditions are safe, you can look from both inside and outside the home for these possible red flags. Under no circumstances should you attempt to check the roof yourself by going on the roof. Even if you have been up there before, you might find loose shingles are under your feet. Let a trained and experienced roofing contractor in Simsbury take care of the job for you. Weathering a storm of any kind may not be a pleasant experience, but you can feel good knowing that Brian O'Donnell Quality Home Improvements will be there for you. Let us take care of a professional post-storm roof inspection and provide you with the assessment data you need. From there, we can also guide you through the storm damage insurance claims process. While we certainly do not want you to have to go through something like this, we feel good knowing we can be there. The whole point of providing exceptional customer care is to be there for your clients when they need you the most. So rest assured, after disaster strikes you can count on us to be there for you. If you need storm damage repairs, please call our roofing contractors at 860-658-2474 or complete our online request form.